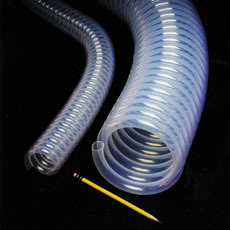 FEP tubing is formed into coils for use in UV purification systems. High volume production provides tight tubing size to coil ID ratio, resulting in close proximity of the fluid to the UV bulb. This reduces the power required to achieve an effective bacteria kill rate. The smooth “no stick” surface of FEP fluoropolymer resists the formation of deposits that would limit UV transmission. Core sizes range from 3/4″ to 5″.